of folded paper during the process of punching holes for the sewing of the book. This one is similar to the Binders board and duct tape versions, but is stronger and better looking, with no sticky tape to leave residue on your art. Ideal for both studio and classroom use. 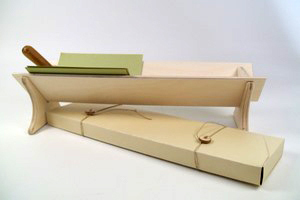 Leave it assembled in the studio or collapse it for travel to classes. Constructed of 1/4" Baltic Birch plywood. Size:(assembled)14" x 4.5" x 3.75", (collapsed) 14" x 3.5" x 1"